From 8-16 September 2018, our award-winning collective of artists, makers, and designers will open their studios to the public. Now is your chance to join them. To apply for inclusion in this year’s event, to be included in the Annual Directory we call the Book and, have a searchable page on this website you fill in the form here. All details regarding prices are on this page and if you have any queries you might find the answer on our FAQ page. We look forward to welcoming you. As part of our continued commitment to encourage creativity and in support of Creative Scotland’s Year of Young People, we will be providing 8 bursary places to young artists aged 18 to 26 who would like to take part in NEOS. 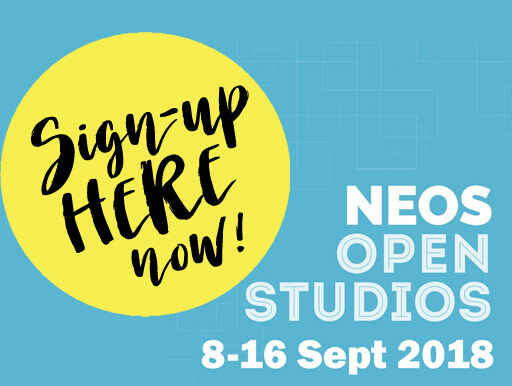 If you are a new young artist who would like more information about this year’s bursary programme, an established artist, maker or designer who would like further information about NEOS, please contact us or sign up for our mailing list to ensure you don’t miss a thing.